As mother selects fabric, little sister enjoys a sweet treat while brother has Christmas dreams of the sled displayed overhead. 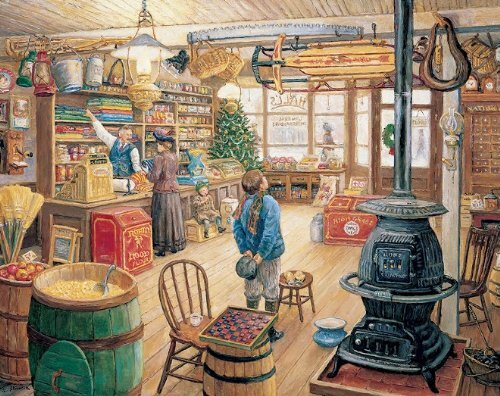 Hark back to a simpler time with this beautiful jigsaw puzzle featuring a scene inside an old-fashioned country store. The potbellied stove warms a scene chock full of memories of the good old days. The Olde General Store is the inspiration of artist Lee Stroncek. The scenic jigsaw puzzles by artist Lee Stroncek reflect his joy of painting the landscapes and creatures that have inspired him through the years. His beautiful paintings are sure to inspire some memories of your own. Art jigsaw puzzles are a fun and inexpensive way to enjoy beautiful works of art firsthand. Jigsaw puzzles are also used to boost cognitive skills; develop hand-eye coordination, fine motor skills, problem solving, shape recognition, memory, and task completion. The White Mountain Puzzles – The Olde General Store includes 1,000 unique interlocking pieces made of sturdy blue chipboard on recycled paper. Extra large sized pieces for easy handling. Puzzle dimensions (completed): 24 x 30 inches. Every White Mountain Puzzle is proudly manufactured in America with a 100% customer satisfaction guarantee.